New to our store for 2016 is the Greenworks cordless electric snowblower, and we are excited for this powerful little unit! For years, we have sold electric snowblowers, which work well and don’t have trouble starting year after year, but you still had the extension cord to hassle with. 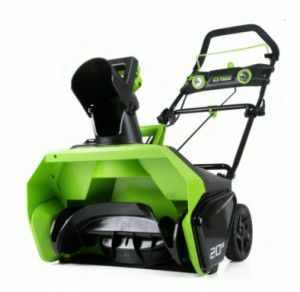 Forget the extension cord with the new Greenworks 40V lithium cordless snowblower! We have been getting quite a bit of interest on this snowthrower, and the two questions that we always get are (1) how long will the battery last and (2) how far will it throw the snow? This 40 Volt lithium battery offers the best in battery life and extended power that last for the duration of the charge. The battery will last up to 45 minutes of run time and will throw snow up to 20 feet away! These are numbers slightly less than gasoline units, but very suitable for most driveways and sidewalks in our area. Other benefits and features of this Greenworks 40V cordless snowblower are effortless starts with no messy oil and gas to worry about. There is no maintenance outside of charging the battery before each use, so you can be sure that it will start up year after year without any hassle. Like all snowblowers, this unit features a 190 degree re-directional chute to aim the snow where you need. Clearing width is 20″ wide and up to 10″ tall.. Finally, customers are wondering what others have thought about the unit… is the feedback good? This unit is brand new to us, so we don’t have direct feedback, but it is well reviewed online and customers are really liking how much power it packs in such a small and lightweight frame. Greenworks has been a great line-up for us all year; we started with their lawn and garden power tools this spring and the feedback has been very positive, so we are confident in all that they make. Stop in to see all of the very cool features of this cordless snowthrower.